Thanks to incredible support by more than 200 donors the fundraiser for the second Palestinian Advanced Physics school was a great success! The school will become a reality and will take place at Al-Quds University on July 2017. Follow us on Facebook to keep up to date with the news from the school, and for updates on other initiatives. Although this particular campaign has ended, if you would still like to support our activities we have started a continuous fundraiser here. Thus please consider donating if you can – your donation will make a difference to science in Palestine. No donation is too small! Preparations for the second Palestinian Advanced Physics School (PAPS 2017) to take place at Al-Quds University, Jerusalem, are well underway. A fundraising campaign to help make PAPS 2017 a reality is going well, with over 70% of the funds raised! A very big thank you to all our generous donors! At the recent physics school organised by Scientists for Palestine, a quarter of the students and key members of the organising committee were from Birzeit University. 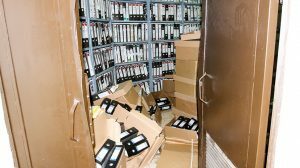 It therefore grieves us to see that today this university was again raided and vandalised. As fellow educators we are deeply saddened to see the occupation’s ongoing obstruction of teachers and students in their pursuit of knowledge. “[H]igher education shall be equally accessible to all on the basis of merit”, states article 26 of the Universal Declaration of Human Rights, adopted by the UN General Assembly in 1948. We, “Scientists for Palestine”, the organisers of the first Palestinian Advanced Physics School, embrace the declaration of human rights. It is then with deep regret that we note that the right to education has again been violated by the Israeli occupation of Palestine. 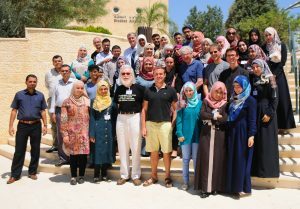 The Palestinian Advanced Physics School, held at the Arab American University in Jenin and attended by roughly thirty Masters students from four Palestinian universities on the West Bank, included lecturers from world-leading international scientists, problem solving sessions and tutorials. The school was regarded as a major success by the attending students, lecturers and organisers alike, yet we regret that a highly merited student from Gaza, accepted to the school, was not granted permission by the occupation to travel to Jenin and attend the school — a clear violation of this student’s human rights. Despite the hardships caused by the occupation, science in Palestine continues to grow and strengthen its international connections. Scientists for Palestine will be proud to continue to support this development. 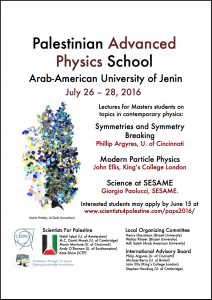 Thursday July 28th concluded the first ever Palestinian Advanced Physics School hosted by the Arab American University of Jenin and organised by Scientists for Palestine. The three days school attracted world famous scholars giving lectures ranging from foundations of particle physics to applications of synchrotron radiation, from the mathematical structure of symmetries in nature to surprising effects of light-matter interactions. The school was attended by roughly 30 Palestinian physics master students from four Palestinian Universities (An-Najah, Al Quds, Arab American University and Birzeit). This was the first event organised by Scientists for Palestine, and we were thrilled to see how all our preparations would turn out. Fortunately the success of the school exceeded our expectations. Everyone involved, from the students to the lecturers, were very happy for the whole duration of the school. Wonderful lectures were followed by engaging and stimulating, hands-on, problem solving sessions and each day ended with a Palestinian dinner provided by the organisers. There is no better way to do physics than with a smile on your face and delicious food in your belly! There was only one shared criticism: the school was too short! We are already working on a possible week-long school with a broadened scope, for future years. We, Scientists for Palestine, are very grateful to CERN, the Sharing the Knowledge Foundation, the Arab American University and Birzeit University for financial and practical support for the school. Moreover, we are enormously grateful to the work and support of Dr. Adli Saleh (Arab American University) and Dr. Wafaa Khater (Birzeit University). Without their contributions and guidance the school would have not been possible. More photos from the school can be found on the Scientists for Palestine Facebook page.